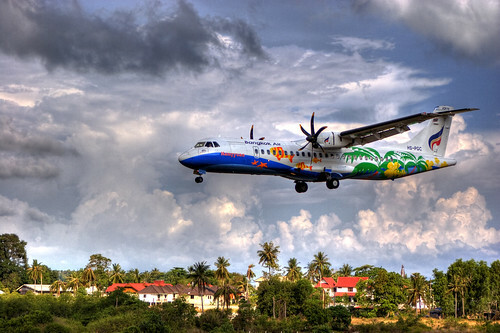 This information will be useful and interesting to those who have not yet been to Koh Samui airport, which for many years consistently is ranked among the top ten airports in the world, standing right next to Changi airport (Singapore), and many other famous and beautiful airports from all around the globe. The construction of Koh Samui airport began in 1982, and in April 25, 1987 the airport started operating its first flights. The length of the runway is 2,100 meters and it perfectly blends with the surrounding landscape of this beautiful island. It has received its international status on 25th of September 1997, there has been added immigration and customs departments, additional terminals and direct international flights to Koh Samui. As soon as the airport started to work, it immediately began gaining all sorts of awards and prizes, it was also named one of the most environmentally friendly and most beautiful airports in the world. 1996 - The Environment Impact Assessment Award (EIA Award). 1998 - Asia Architectural Design Award. 2006 - Smart Travel Asia “Best Airports Worldwide polls” - Samui Airport was ranked 4th in the top 10 best airports in the world. 2007 - Smart Travel Asia “Best Airports Worldwide polls” - Samui Airport was ranked 8th in the top 10 best airports in the world. 2008 - Smart Travel Asia “Best Airports Worldwide polls” - Samui Airport was ranked 10th in the top 10 best airports in the world. 2009 - Asia Architectural Design Award. 2009 - Smart Travel Asia “Best Airports Worldwide polls” - Samui Airport was ranked 10th in the top 10 best airports in the world. 2010 - Tropical Building in Thailand Energy Awrds 2010 - Award from the Ministry of Energy of Thailand in the category of alternative energy sources and efficient use of existing energy resources. 2010 - Smart Travel Asia “Best Airports Worldwide polls” - Samui Airport was ranked 10th in the top 10 best airports in the world. 2011 - Tropical Building in ASEAN Energy Awards 2011 - Award from the Ministry of Energy of Thailand in the category of alternative energy sources and efficient use of existing energy resources. 2011 - Smart Travel Asia “Best Airports Worldwide polls” - Samui Airport was ranked 9th in the top 10 best airports in the world. 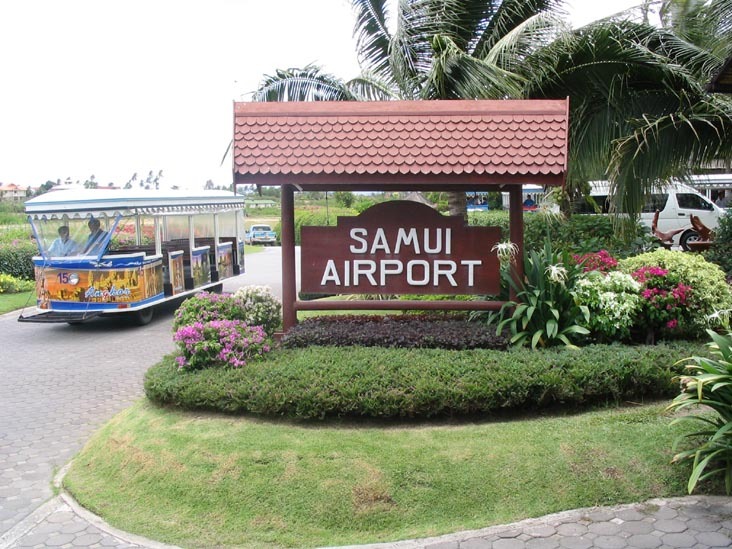 2012 - Smart Travel Asia “Best Airports Worldwide polls” - Samui Airport was ranked 10th in the top 10 best airports in the world. Sing this map, you can figure out where some particular areas and beaches of Koh Samui are, approximate distance (total circumference of the ring road is about 50 km) and choose those places where you would like to rent a house on Koh Samui, as well as avoid those where it is not worth it, so as not to flinch every hour from an aircraft flying over your head. you can visit Duty Free shops, boutiques and cafes are located right on a picturesque streets, under the open sky. On the sides you can see gates. There are no walls, only the roof. In the same hall there are computers to access the Internet, there is wireless internet, sockets for charging, free buns, bananas, coffee, drinks. they deliver those arrived on the island to the area of passenger arrivals and baggage claim. Upon arrival, you can either book a private transfer to the hotel or take a minibus. The transfer fee can be specified on the official website or you can order a private transfer around Koh Samui or rent a vehicle from us. Note that taking a mini bus from the airport may not be suitable for those who arrive early in the morning or late at night. After 22.00 there will certainly be no minibuses to take you to your hotel.. There is a paid parking space for cars on the territory of Samui Airport in the arrivals area. There is also one for motorbikes and it's free. In that area where the embarkation and disembarkation of passengers takes place it is forbidden to park a vehicle for longer than 15 mins. At the departure area cars and bikes can be parked for free. We believe that even though the price tag for the flights from the monopolist and the owner of the Airport - Bangkok Air is too high - you must at least once in a lifetime arrive on Koh Samui at this airport! And it is best to fly during the daytime, in a good weather, and with a camera! And finally - an amazingly detailed virtual tour around Samui Airport.